Orthodontic treatment is the treatment of disturbances of the development of dentition using special orthodontic appliances. This avoids some violations face shapes are normalized acts chewing, breathing and speech, to correct the wrong location of the teeth, the form and the ratio of dental rows (see the Bite). Orthodontic devices are subdivided into: 1) correcting (correcting the position of individual teeth); 2) stimulating teething and growth of the alveolar process; 3) extending the teeth; 4) squeeze (narrowing) dentition; 5) mixed (corrective, stimulating, expanding); 6) retention (warning relapse anomalies). The action of orthodontic apparatus, is that pressure on the tooth in the periodontal creates thrust and pressure, which on the one hand tooth is resorption (resorption of bone, and bone formation. As a result, the tooth moves horizontally. To move a tooth vertically used nakonechnyy record, which puts pressure on the appropriate tooth and thereby causes a process of restructuring in his periodontal vertically. In different periods of growth and development of dentition orthodontic treatment methods are different. In the primary dentition used extraoral orthodontic appliances or intraoral based on the alveolar and palatal processes jaw. To position the spacecraft in milk teeth is not advisable as it can disrupt the normal process of resorption their roots. In the period mixed dentition, when there are milk and permanent teeth, support for orthodontic appliances are permanent teeth. The timing of the orthodontic treatment is not installed, in each case need to consult a dentist. Orthodontic treatment methods (from the Greek. orthos - direct and odous, odontos - tooth - treatment of anomalies subcluster-facial system. Anomalies can result in deviation of the number of teeth in the direction of increasing or decreasing, the violation of a provision of certain teeth, teeth groups, relationships teeth, jaws (see Bite), and change the anatomic form of dental arches, jaw and other facial bones, causing a violation of the basic functions of tooth-jaw system and often accompanied cosmetic defects, sometimes bordering with disfigurement of the face. The study of a patient with this anomaly begin with an examination of the face, teeth, soft tissues of the mouth, tongue, palate, the tonsils, determine the type of occlusion. Additional examination includes the study and measurement of jaw models and photos person; x-rays of the teeth, alveolar process and middle seam of the upper jaw; tomography of the temporal-mandibular joints; study of teleroentgenogram (direct and side images of the skull and soft tissues of the face and head); masticatory (record chewing movements of the lower jaw) and electromyography (record of currents arising in the muscles). This study will identify the location and degree of morphological and functional changes in the current anomalies, respectively plan of treatment to choose the method and determine prognosis treatment. Orthodontic treatment of children should begin possibly earlier to ensure the proper development of tooth-jaw system and formation of the person. Orthodontic treatments are aimed at moving the teeth, changing relationships dentitions, the restructuring of temporomandibular joints and improve muscle function. These methods include: gym, massage, preventive or auxiliary surgical intervention and the effect with the help of orthodontic appliances. Gymnastics needed to restore the disturbed balance between the different groups of muscles, to improve the function is weakened, untrained muscles. Basic exercises are aimed at activating the circular muscles of the mouth, podnikatela and vydyasala lower jaw muscles of the neck and shoulder area, and other muscles that support the correct posture of the body. For normalization mechanism swallowing and speech articulation appoint special gymnastic exercises: for a language - clicking the language at a wide-open mouth, slowly slide his tongue across arch palate to the soft palate in the position to keep the language until fatigue; for stimulation of muscles, retragerea language, it is recommended while eating low tilt your head over the bowl, for the muscles of the soft palate, throat and tongue - water procedures, exercise "oscitations", and also massage the soft palate. In the treatment of groups of children with unhealthy habits sucking, tongue, lips) an integral part of the therapeutic complex is psychotherapy, and in cases of persistent habits - the suggestion in the state of hypnotic sleep. It should be emphasized the need for the nasopharynx in children with malocclusion. It is necessary to remove the rear, the milk teeth, additional teeth, cut shortened frenulum of tongue and low attached powerful bridle lips. In some cases, require the complete removal of some permanent teeth, holding compactsteam, and when pronounced steady anomalies - a more advanced operations on the jaw with orthodontic treatment. 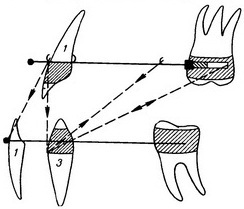 All applied for orthodontic treatment methods devices on the mechanism actions are divided into: 1) mechanically operating in the use of the screw, the elastic properties of the wire, alloys, arm; 2) functionally active affecting the teeth by means of inclined planes, nakonechnyi sites, guides loop at the time of muscles; 3) combined. By way of fixing all the devices can be fixed and removable; intraoral, extraoral and combined. For orthodontic treatment of children with milk and mixed bite mainly use removable devices and extraoral rubber cravings for distal move the lower jaw, upper and lower teeth. 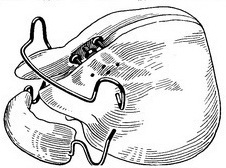 When the permanent dentition required predominantly non-removable devices and extraoral thrust, horizontal and vertical, relying on the back of the head and the body of the skull (Fig. 1 and 2). Removable devices include various plates, screws and inclined planes to section bite (Fig. 3 and 4). This important documentation (it is best to use clasps Adams). 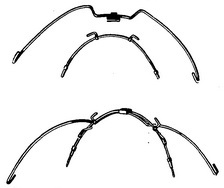 These devices can be for one jaw and for both simultaneously (monoblock Andersen, activator of Billera, functional regulator Frenkel and others). Fig. 1. Standard intraoral arc and removable extraoral arc. Fig. 2. Reference cap vertical extraoral rubber traction in the treatment of malocclusion and horizontal thrust - to move the upper teeth on the basis jaws backwards. Fig. 3. Removable orthodontic plate for the upper jaw with clasps Adams, spring and screw to move the individual teeth. Fig. 4. 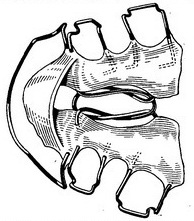 Removable plate for the expansion of the upper jaw with springs Coffin, inclined plane and clasps Adams. Fig. 5. Monoblock type device Andersen. Fig. 6. The vestibular system is functional regulator Frenkel. dentition, and alveolar processes, extraoral rods and rubber rings, stretched between the ends of the rods. Usually monoblock machine (Fig. 5) apply with screw for simultaneous expansion of both jaws and move the lower jaw forward. On the vestibular arch there are additional loops, squeezing which can reject protruding upper teeth to the sky. It is necessary to cut plastic for roaming teeth. The device has pilot to lead active lower lip from bits, which is required when bad habit to bite his lower lip. 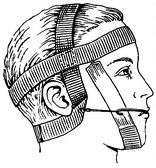 Another group of devices for both jaws are vestibular apparatus. One of them - functional regulator Frenkel (Fig. 6), located on the eve of the mouth, provides discharge cheek muscles, preventing sometimes the correct growth of the jaws. There arc vestibular for slope upper incisors to the sky and speaking to reject the lower incisors to the lip. Use and other types of such devices. Fig. 7. The scheme of two fixed arc angle. To the non-removable devices include mechanical: arc angle with nuts for the expansion of the jaws fixed in the rings with tubes mainly on the first molars, and moving the arc without nuts with rubber rings to address the three between the teeth. In cases of severe malocclusion can be applied premaxillary oblique or vertical traction with two arcs angle with hooks and rubber traction. In Fig. 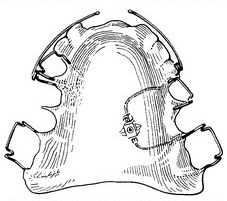 7 the scheme intraoral vertical and oblique rubber traction in the treatment of severe protrusions, complicated by the open bite. The upper arc is bent in the form of populipsi respectively form the correct arch, which with the help of bronze-aluminum alloys tie teeth located wrong. Nuts standard arc installed with emphasis in the sleeve, soldered to the rings on the support first molars. To strengthen support for intensive extension of the upper teeth toward the front apply fixed arc strengthened on the lower dentition. Slash rubber traction facilitates the movement of all fixed to the curve of the upper teeth forward on the basis of the alveolar process, and the lower back. This achieves the right balance of dental rows in the sagittal plane. The lower arc is also a support for stretching highly placed teeth of the upper jaw rubber rings. For expansion of dentition is also used non-removable devices of Ainsworth, Persona, Atkinson and others, which are based on the elasticity of the wire is introduced into the locking device on the rings, reinforced with cement on the teeth. The treatment results are achieved by using the apparatus shown in each case, fixed some time retentional apparatus, which can also be removable and non-removable; often they are the same devices that were treated only in an inactive form.